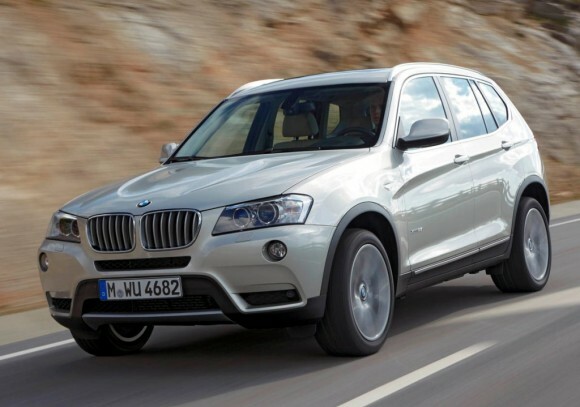 This first generation BMW X3 became a best seller in the BMW line…both in the United States and in Europe. Through its lifecycle, over 600,000 original X3s have been sold worldwide with 150,000 sold in the USA. Subsequently, several competitors have entered the now hotly-contested segment. The new second generation BMW X3 builds on the success of the original by developing its core competencies while adding new technology to establish new benchmarks for agility, efficiency and comfort. The X3 shares styling cues with the X5 and the X1, but is generally more conservative, likely on purpose. The X3 now gets BMW’s “corona rings” headlights, although HID will be optional. LED lamps finish the rear. The new X3, chassis code F25, is half an inch taller, 3.36 inches longer and 1.1 inches wider with a half-inch increase in ground clearance. The joystick-style transmission lever carries over from BMW’s most recent models, along with an 8.8-inch iDrive-controlled screen and a redesigned steering wheel with aluminum accents on the paddle shifters and lower spoke. With the rear seats set in place, rear cargo volume comes in at 19 cubic feet, growing to 56.6 cubes with the 60:40 rear seats folded flat. The entry-level X3 xDrive28i comes equipped with BMW’s naturally aspirated 3.0-liter inline six rated at 240 horsepower and 230 lb-ft of torque, allowing the BMW X3 to sprint 0-60 mph in 6.7 seconds – about a half second quicker than the outgoing model. Step up for the X3 xDrive35i and you have access to 300 hp and 300 lb-ft provided by BMW’s new single-turbo N55 inline-six. The 0-60 mph run clocks in at a claimed 5.5 seconds, with a top speed of 150 mph when fitted with the optional Sport package. Channeling that power to the ground is a standard 8-speed automatic gearbox with wider spreads and taller cruising gears to keep fuel economy in check, while standard all-wheel drive splits torque 40:60 front-to-rear thanks to an electronically controlled multi-disc diff and a host of other stuff. The MacPherson front struts have been redeveloped along with the multi-link rear suspension, while an optional electronic damping control adapts to the road and driver inputs. Normal, Sport and Sport Plus modes are mounted next to the gear selector, tweaking throttle response, transmission shifts, steering assist, DSC settings and suspension firmness. The newest electronic system for the X3 is the Performance Control feature, which shuffles 80% of the torque to the rear under steady-state throttle. The BMW’s system brakes the inside rear wheel and powers the outside roller to curb understeer and provide a more neutral driving feeling. The new BMW X3 will be produced in an expansion of the South Carolina plant and is expected to arrive in US BMW Centers by the end of 2010.